A few weeks ago, while visiting my mother, she told me that my Aunt Rita had given her something to give to me and that when I open it, she was going to need to take a picture of me when I open it. She added “And that’s all I’m telling you!”. What??? First, I love surprises, but what on earth would my Aunt give me that would be so important that my mom would need to take a picture of me opening it? Second, why would my mom think I was going to force it out of her, as to what it was before I opened it? I love surprises! So, she handed me a box. It was a white dress shirt box with a printed note from my Aunt Rita on top. 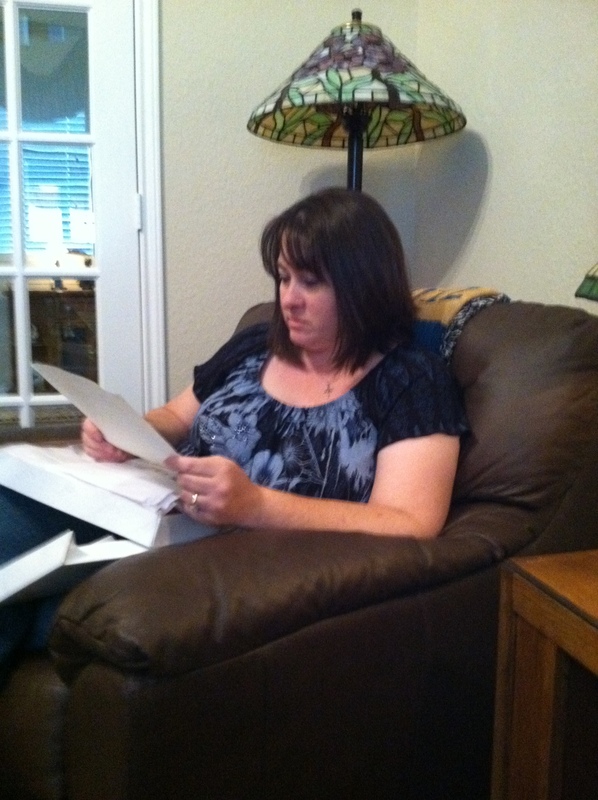 As I sat in her library and read the note, she snapped a picture. The flash and snap distracted me, so I read the same sentence over. My Aunt Rita has always had a knack for writing. The note was so sweet and said something to the effect that this was something that Maw Maw had given her and I being a knitter, she wanted me to have it because she knew it was something I’d treasure and she was sorry that bugs had gotten to it and chewed holes. So I opened up the box and pulled away the tissue it was wrapped in and there it was… a beautiful, rose-colored shawl, made from finger weight wool. It does have holes in it, but I still thought it was beautiful. And super special since my great-grandmother had knitted it for my grandmother. I was told she knitted it for her when she was a teen and I figured up that she probably knit this shawl in the late 1930’s. Wow! It’s a unusal shape shawl, knit in garter stitch with the fan and feathers pattern along the edge, followed up with a few more rows of garter. 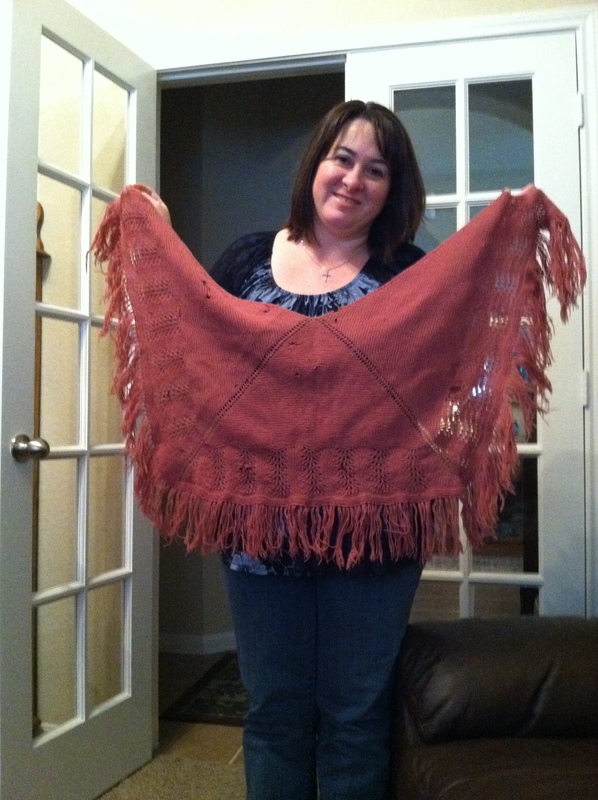 The shawl has fringe along the edge. What a neat piece of knitting to have and I know exactly what to do with it! I plan on getting it framed and hanging it in my knitting/craft room. So, my first thought was how do I repair this shawl and who do I go to, to ask questions? Well, Ravelry.com of course! So I posted some pictures and asked my fellow knitters how they would repair the shawl. These ladies were awesome! They told me I should freeze the shawl in a plastic bag for a few days. Then remove it from the freezer and let it sit a day or two and freeze again for a few more days. This process is to get rid of any moths or larvae that might still be on the shawl. Then one lady, who is obviously a genius, told me I could use some of the fringe to repair the holes with a tapestry needle. Brilliant! I was wondering how I was going to match the yarn! Another wonderful lady gave me the name and contact info for a place in my city that professionally frames special things like this, so I will definitely be checking that out when I’m ready. My shawl is now in the freezer and I’m going to pull it out tonight. 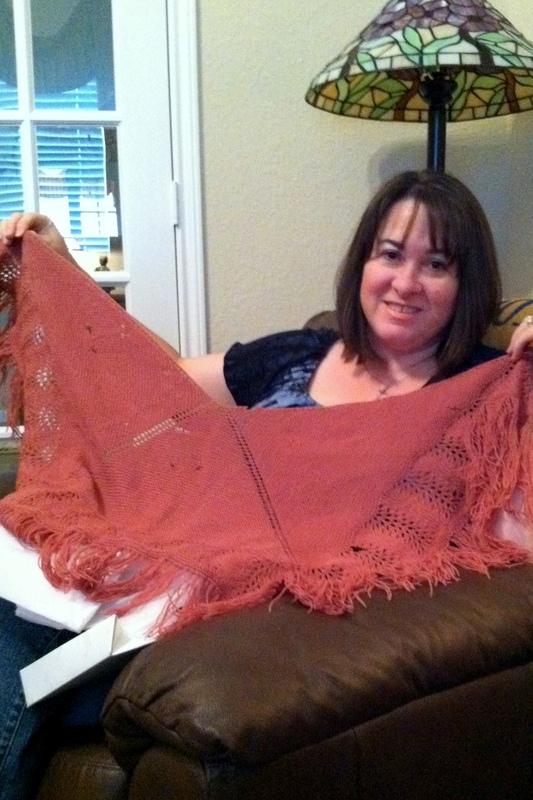 Here are some pictures taken the day I opened the shawl. I’m sorry that the pictures aren’t very clear. They were taken with my cell phone.